Did you know Americans are expected to spend around $720 billion this holiday season? (1) That’s a lot of photo cards, candy canes, Michael Bublé CDs, Santa hats, plush novelty socks, and sparkly ornaments. But unless you intend on skipping Christmas this year, you’re going to find yourself a part of that $720 billion. To keep from completely “sleighing” your bank account, though, set up your budget and stick to it like sap on a real fir tree. 1. Plan how much you’ll spend this year. The average American’s holiday spending is around $1,000. (2) You should never feel pressured to spend that much—or more, or less! The amount you should spend is based on what you make, what you’ve saved, and what you can move around in your budget to get the jingle-bell job done. So crunch some numbers and see how much you’ve got to elf around with this year. 2. 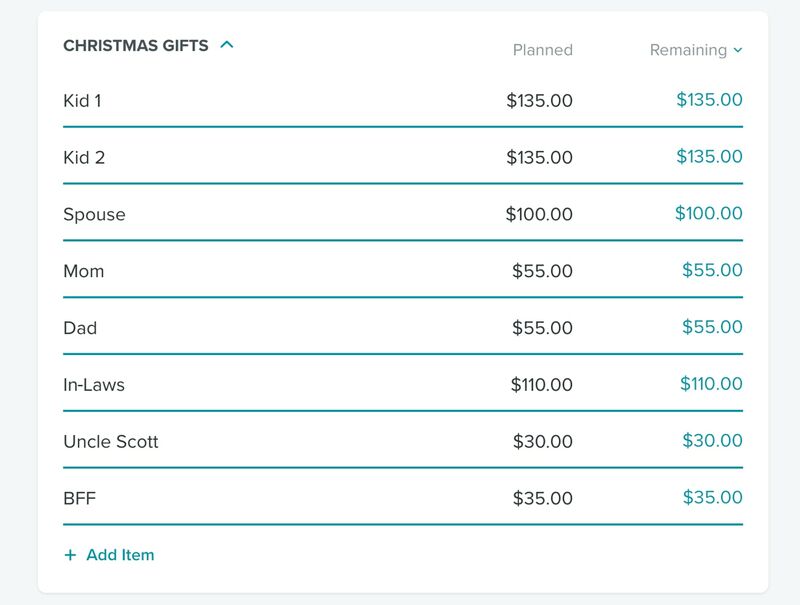 Create a Christmas budget category in EveryDollar. Sign into your EveryDollar account, scroll down to the bottom, and you’ll see + ADD GROUP. This is how you add a new category. Name it what you will: Santa’s Stash, Festive Finances, Merry Money, or the boring name we’ve given here—Christmas Gifts. 3. 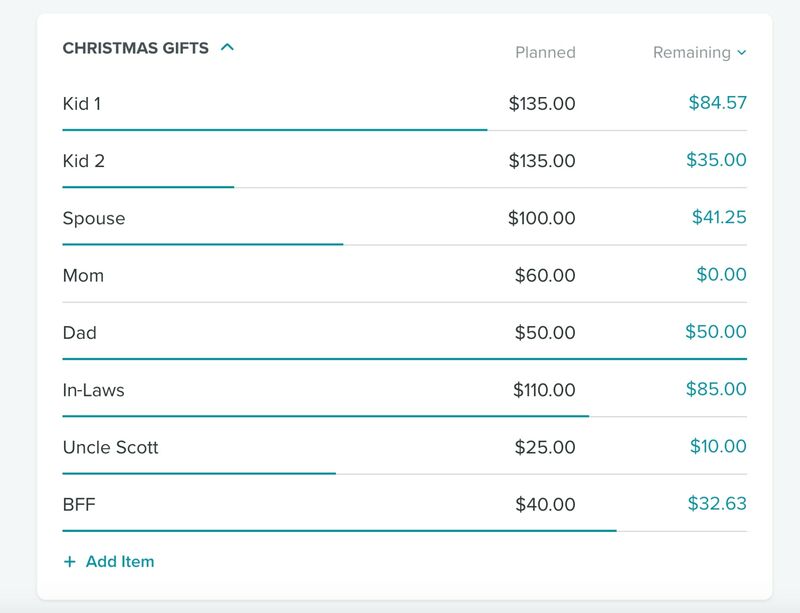 Add in the names of everyone who needs presents by clicking Add Item. Yes, you’re going to click Add Item and type in the name of each person you have to buy for. No, you don’t think people are items. It’s just budget terminology, folks. At this point, you’re going to assign spending limits to each person as well. 4. Track your spending as you go. Want to know how you don’t overspend? You track. You track hard. You track often. Keep up with all that spending as you go. Log in to your budget, click on the orange plus sign below the word Transactions, then click the next orange plus sign by Add New. Then, record the expense! Or get EveryDollar Plus for yourself this Christmas. It connects to your bank account and streams the transactions over for you. All you have to do is drag and drop each purchase into the correct line item of your budget. That’s simpler than any reindeer game, and way more beneficial too. 5. Move amounts around when needed. Oh no. You overspent on Mom. By $5. What will you do? Sorry, Dad, that five spot’s coming from you. Oh yay! That ugly-sweater-wearing cat mug you wanted for your BFF is on sale, so now you have a little extra for someone else! Move that $15 over to your spouse, so you can afford those tickets to see the next history-based, all-rap musical. Yes, you can move around amounts after you put them in there. And you should. As situations similar to these hypothetical examples go down, move the money all around! 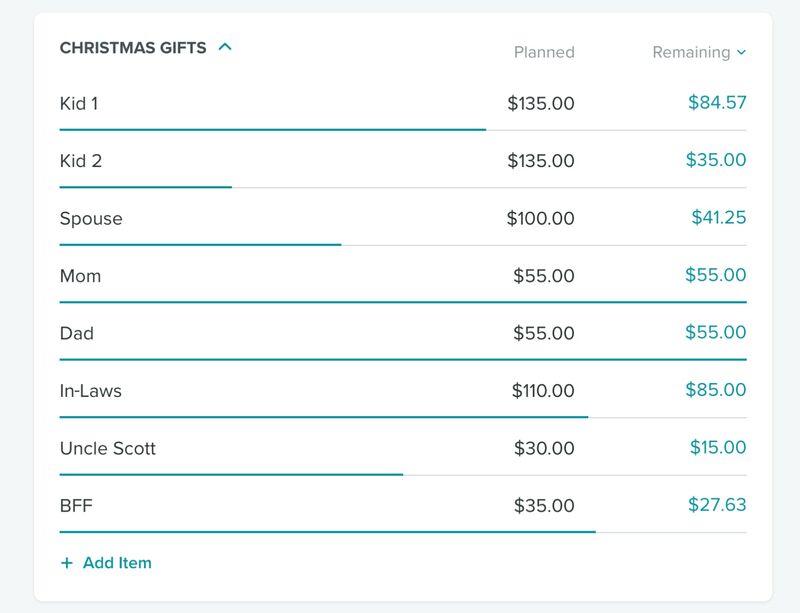 Just make sure you don’t overspend the total amount you set up for the entire Christmas Gifts category. Start planning today. 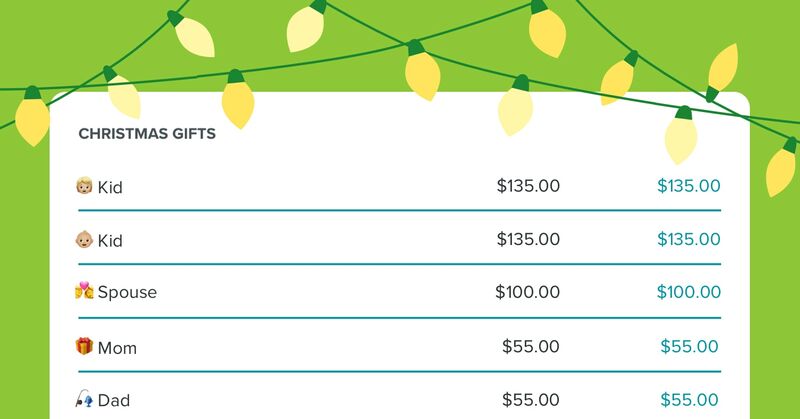 Log into your EveryDollar account and you can oh, by golly, have a holly-jolly budget this year. Create a free EveryDollar budget today!